I have RNA-Seq data with 32 samples. I used Salmon to generate a read count matrix. I want to generate a PCA plot to look at the relationship between my samples. How do I use the read count matrix to perform the PCA analysis? You should normalise your data prior to performing PCA. In the code below, you'll have to add plot legends yourself, and also colour vectors (passed to the 'col' parameter). I also want to perform a PCA plot. I have a read-count matrix data. You mentioned that we need to normalize data prior to PCA plot. Could you please help me how to normalize the data? Hi Mehmet, from where did you obtain the counts or how did you produce them? I guess we obtain reads counts from HtSeq, and performed DEG analyses using edgeR. I have 23 samples. Previously, I generated a PCA plot using read.count.matrix data following your codes above. I also would like to ask you; what is difference between generating a PCA plot from PC1 to PC5, and PC1 to PC10? Hi Mehmet, I have not used EdgeR (I prefer DESeq2), but PCA should be performed on normally-distributed counts, so, your normalised logged counts. 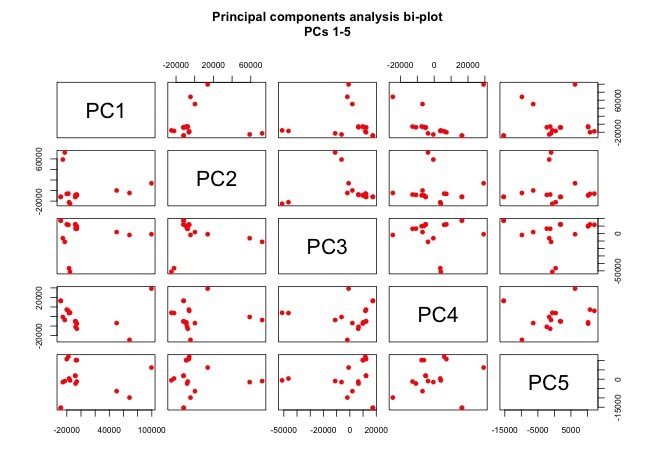 There is no difference between the generation of the pairs plots for PC1-5 and PC6-10. It is just a matter of fitting all of the plots on the same page. Technically, you can generate a pairs plot for PC1-PC100, but you would require a very large plotting window. Hi Kevin, Thank you very much. Should I do anything in my FPKM data prior to PCA plot? 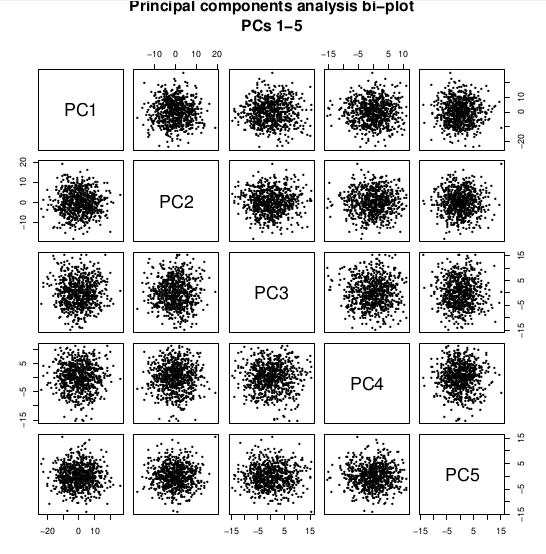 I have run analyses to generate PCA plot (pairs plots). I would like to ask you a few things: 1. What are the dots in boxes? 2.What are the numbers around each boxes? I have 17 samples in my data, but I have 15 dots in boxes in the plot. could you please help me about how to interpret results ? If you have used HTSeq followed by EdgeR, then you should have logged counts(?). How does the distribution appear when you run: hist(MyData) ? Can you post an image of the pairs plot and provide the code that you are using to execute the PCA? You can upload figures/images here, and then copy/psate the URL here in your response. I have uploaded two figures. You need to post the URL's for the figures in your post. Looks okay to me. In the second one, the title is incorrect though, as it's PC1-10. You could also make the dots smaller here, but it's not that important as these plots are mainly just for QC. What's the variance explained on PC1 and 2? How to interpret the graphs? and what is the meaning of the dots in the boxes? As I have 17 PCs, should I show 17 PCs in the plot? Should I use column names also? 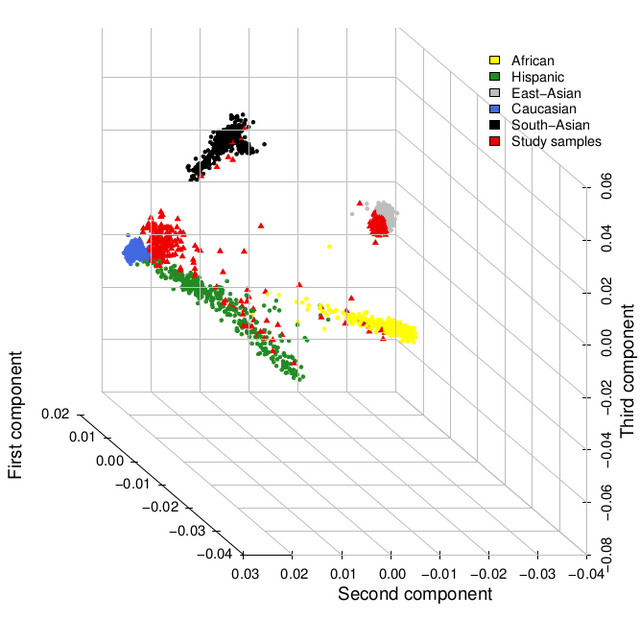 There are several type of PCA plots. Which should I use in my paper? 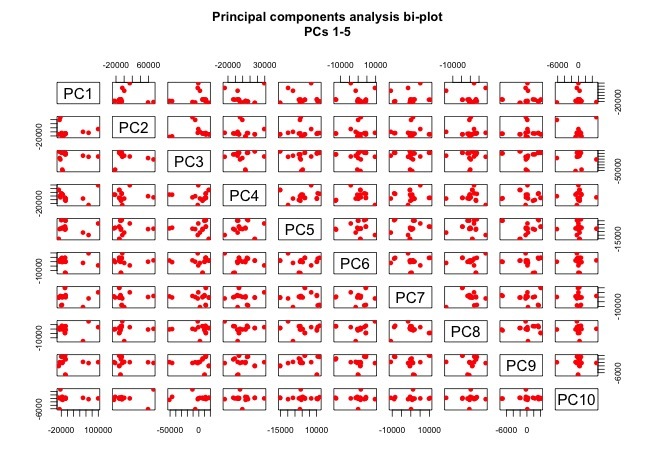 The PCA bi-plot at https://www.bioconductor.org/help/workflows/rnaseqGene/#pca-plot is generated using the plotPCA function in DESeq2. It is usually used when processing RNA-seq data. However, this function is biased because it removes a large proportion of genes of low variance from the dataset prior to performing PCA, which defeats the purpose of conducting the PCA in the first place. My methods perform a completely unbiased PCA. Each dot is a sample. Hello, yes, it would be interesting to see that. You have RNA-seq data for these samples? Yes I do have 5 genotypes (3 samples per geno) and a control and treatment. 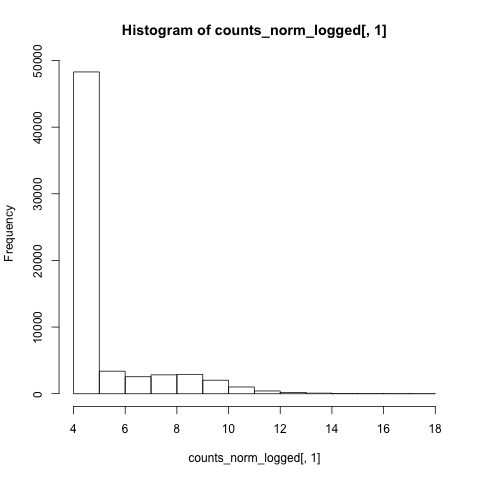 Just a quick additional question, I have normalized my counts using DESeq, and then log transformed (log2) my data, but do you do something about the zero's in the datasets when doing the log transformation? Since they will give a infinite negative value. Do you add something to those zero's? Also, do you do any removal of lowly expressed genes, nor not for this kind of analysis? Thanks!! PCA is then performed on these r-logged counts. "rlog() may take a long time with 50 or more samples, vst() is a much faster transformation Error in DESeqDataSet(se, design = design, ignoreRank) : some values in assay are not integers"
Do you have an example of code that could get me from raw counts to logged normalized counts to use in PCA? If you need more info on my samples please let me know. Thanks! Oh, that error is common. When the dataset is large, it is indeed better to run vst(), and then you access these again via the assay() function. These are perfectly fine in place of logged counts. Are you actually testing anything as in differential expression? Here, condition would be, like, the CaseControl variable. Thanks! I'm going to try around with DESeq2 and if I need more help I will open a new question. Would you know how this would compare to PCA? I think the data except for the large bar of unexpressed genes might have a distribution more similar to a normal distribution, but how to deal with this? Hey, that does not look like logged or variance-stabilised data. Can you show the code that you used? Regarding MDS and PCA, the mathematical formula behind each is different, but they both ultimately show relationships between samples / variables. Note that MDS can be performed using the PCA transformation. You may consider a new question for that, as my time is extremely limited today. Thanks! That doesn't sound good.. 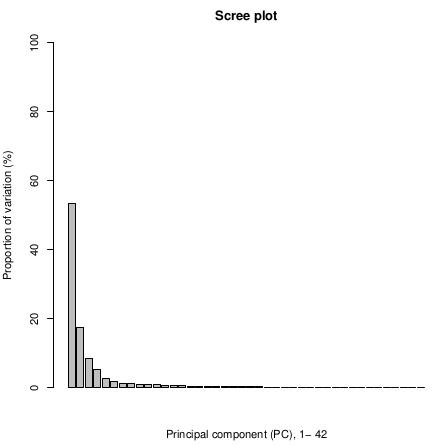 I've started a new post here: How to normalize count data for PCA in R - something goes wrong in case you would like to comment which I would greatly appreciate. I've posted the code there as well. Hi Kevin, I am a new one. Would you please explain how to set legends with color in biplot? My data: each column is a sample, each row is a gene. Thank you very much. The first parameter can be any of "bottomright", "bottom", "bottomleft", "left", "topleft", "top", "topright", "right", or "center"
How can I put the names of the samples in this case? And different colors for it group? Because in the pipeline there are just the basic information to plot a simple graph.